Ghost Upon the Floor: Are You Afraid? You know you're born this way from a very young age. I can remember being a kid, just in grade school, and checking out the ghost story books in the library. Anxiously awaiting a new episode of "Are You Afraid of the Dark?" on Nickelodeon. And knowing there were things out there far scarier. 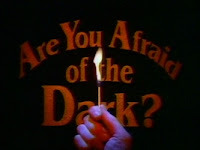 Submitted for the approval of our Midnight Society, tonight I give you the episode of the Nickelodeon show, "Are You Afraid of the Dark?," which ran from 1990-1996 on the children's programming channel in the United States and Canada, that most had its effect on my young subconscious. Perhaps no episode had the impression on me that "The Tale of the Manaha" did. Years later, when I saw "The Blair Witch Project" in the theater for the first time with my friends, and was so terrified I couldn't sleep that night at a friend's house at a sleep-over party, I'd remember this episode, and where the fear of what happens when you're lost in the woods first comes from. It's a pity that kids today don't have shows anywhere near the like of this one.